Hello everyone. Here is our 4.0 beta! This will be an extended beta, with the official release being sometime in September. We are hoping to get as much feedback as possible on the new render engine, performance, quality, bugs....suggestions? 4.0 also includes the encoding upgrades from 3.9. Between the new render engine and encoding engine, we expect to see some substantial performance and quality improvements. Gameshow should not auto detect and set color space, so capture certain sources that had a washed out look, will no longer. Let us know below! New! Brand new rendering engine for Gameshow 4.0! New! Updated rendering engine to D3D11 on Windows! New! Added drag, resize and rotation handles to Preview Editor! New! Z-Rotation added to Preview Editing! New! Reflection added to Layer Properties! New! Support for ASIO audio devices! New! Color space and Dynamic Range options added to Capture sources! The clock widget is super beta, and will have a UI redesign. Bryce Stejskal all better! Thanks. I just like to check it in case there's smaller fixes not listed here. Probably going to buy the updates soon. But I'm kinda scared to download the beta since I'm still having so many crashes. Have you seen those reports? It nags me every time it crashes. I'm loving GameShow! 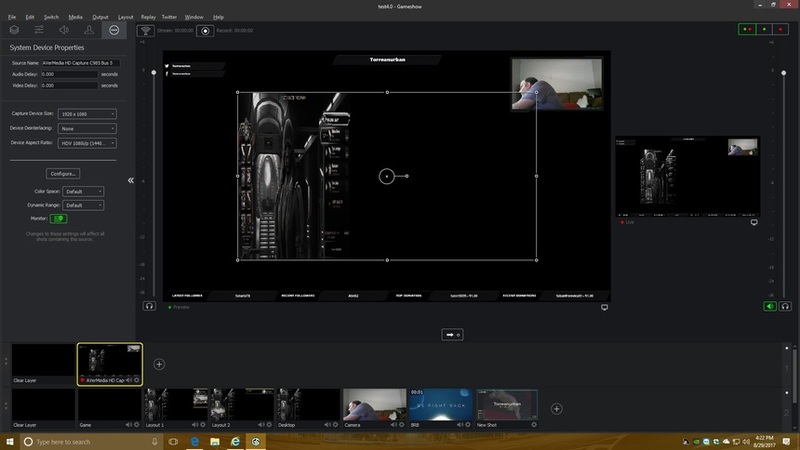 I was wondering if there were plans in the future for a Master Copy feature similar to the Elgato software that will separate your recordings from your overlays and commentary. If you are using a capture card, all you need to do is open up a second document File>New and then add teh capture card to the second document. Then hit record. Go back to your first document, and stream as usual. 4.0 does fix the way that the CPU/GPU on the Intel Skull Canyon NUC picks colors for Chroma. It actually works now. :) I'm guessing that's from the Rendering Engine change? The handles for assets is great too. Great love the changes... Web displays seem to eat CPU for breakfast in this build though.... 1 cup 2 alerts = 100 % cpu usage Stable doesn't have this problem. Well with 4_0_31776.exe on windows unable to select saved encoder presets. It will not keep after clicking more and then selecting the saved presets for NVENC. I don't have that problem but I am on OSX .... Could be a windows issue..
Actually if I reset preferences issue fixes. Should not have to keep resetting preferences after upgrading. Fix this. A lot of times you have to start over from scratch when upgrading. Not good. Now we are back to the bandwidth issue of USB and not seeing webcam Oh eventually I will mess with it over and over and get it to work. But then another upgrade with come out and break things. GameSpeaker nope closed out of gameshow and now re opened and unable to select my presets. I installed last night's 4.0 build 31782 build and the issue with encoder preset appears to be fixed. Webcam seems good now. Quick question: What improvements does the rendering engine have over the previous one? Between the new render engine and encoding engine, we expect to see some substantial performance and quality improvements. Gameshow should not auto detect and set color space, so capture certain sources that had a washed out look, will no longer. Bryce Stejskal should I be submitting a support request to get an answer on those crashes? I would really like a response. Brian A. Calderon Please do. Crash reports without a support ticket attached, well I am not sure I can even associate those to a specific user unless identifying information was supplied with the submission. It would be best to make sure it does not occur with 4.0 first though. Many things are inherently fixed simply due to the magnitude of changes in 4.0. Will there be Smashcast and Mixer support? Bryce Stejskal I'm thinking it might be fixed with 3.9, but just to be sure when one does happen—what is the best way to submit that? Through the bug report with my email? Or to go on the website (probably after the stream) and request help? So trying to find out upgraded from 3.9 to 4.0 everything worked fine on 3.9 but on 4 my avermedia capture card is messed up distorted. How do I fix this or do I have to roll back to 3.9 again? Now it looks like this. We believe we have already fixed this and it should be good when we do our next release. Sadly, the only workaround for the time being will be to rollback until we do our next release. All the capture cards having issues. Logitech C920 incorrect colourspace and DR. The Intensity Pro 4K's are giving black screens on specific sources despite correct resolution detection. HD60 Pro incorrect DR.
Colourspace and DR settings don't work as of 31776. Just wondering if there was an ETA on when Beta 4 will be pushed live? Tarran I think soon since they're not responding to my support request anymore. We have a week off September; so if it's coming out this month… sometime this week!